Tonight comprised the culmination of over two weeks of huge protests in the city of Hamburg in support of the Lampedusa refugee group. Over 9,000 people took to the streets to show their support for the migrants and to demonstrate against the racist and dehumanising stance that the city has taken against the 300-strong group. As well as many undeclared demostrations throughout the next weeks, the main mobilisation from the group is for a city-wide demonstration on Saturday November 2nd. This article is an attempt to compile, in English, information about the ongoing refugee struggle in Hamburg. It is not an attempt at an analysis of the situation and only provides information about the past 6 months since the group’s arrival in Hamburg. It has been written in a hurry and many details have been omitted either by accident or for lack of sufficient knowledge. As I type, I can hear chants of “Kein Mensch ist Illegal! (No-one is Illegal)” from my window. I will attempt a further, less dischevelled account of what has been happening in the near future. For just over two weeks, “Operation Lampedusa” has been in force against the ~300 migrants from Libya that are currently in Hamburg. More than 30 arrests of people from the group and a number of evictions have taken place. Leaving Libya on boats following the unrest in 2011, people who later formed the group “Lampedusa in Hamburg” were granted Permission to stay in Italy and live in refugee camps on the small island of Lampedusa. Following the closure of these camps by the Italian government, The Lampedusa group arrived in Hamburg in April 2013. Upon arrival, the group were not granted housing and many began living on the streets of Hamburg. In late May, a protest camp was established near the central station to provide shelter and a space in from which to organise. The same night, the police declared the camp illegal and confiscated many tents. However, the Steindamm Camp remains the group’s political base of operations. Soon after, 60 of the group performed a protest action in the city’s Town Hall, unfurling a banner on which was written “We did not survive the NATO war in Libya to die on the streets of Hamburg”. This action evolved into a demonstration through the city centre, attracting a huge police presence. The Hamburg city Senate responded with a statement demanding that the group return to Italy. It further rejected calls for consultation with the city’s mayor, Olaf Scholtz. Hamburg residents and small aid organisations provided material support for the group. 80 of its members were housed in the church of St Pauli, while others were housed in various social centres and more precarious living spaces. The group laid out their demands at a series of demonstrations over the following months, which included access to the job market, to housing, to education, and to medical care. A demonstration in June was declared, under the slogan “a goat that is already dead is no longer afraid of knives”. 1500 people participated, and a solidarity festival took place in the afternoon. The group continued to demand the Right of Residence under Section 23 of the Residents Act, with a further demonstration in August in which ~2500 people participated. The group also engaged in projects throughout the city, including a solidarity music festival in St Pauli and information events in local schools. From mid-August, following further rejection from the city Senate of any rights as refugees and despite the efforts from the church towards the Ministry of Interior, weekly demonstrations were called under the slogan “Lampedusa in Hamburg- We are here to stay!”. The Senate responded by forbidding the St Pauli church to set up heatable containers for the group to sleep in during the winter, and by banning the group from access to the “winter emergency programme” provided by the city for homeless people over the winter period. “Operation Lampedusa” began the same week that more than 400 people died on their way across the Meditteranean. The exact details of the operation are still unclear, but the escalation in Hamburg by the police and subsequently from the group’s supporters has developed rapidly during the past week. On Friday night, after an emergency meeting, around 12 people from the Lampedusa-in-Hamburg were arrested. A spontaneous demonstration was called in response, with around 800 people in attendance. The next day saw more morning arrests of people from the group. In response, another large, energetic demonstration took place through the city, with around 1000 participants, against the racial profiling and arrests by the police. It included the slogans “No one is illegal! Right to stay for all!” and “Stop the racist controls!”. Over the following weekend there were more arrests of people from the Lampedusa in Hamburg group, during which police committed many illegal actions. Sunday saw a temporary sit-in of the city hall by around 50 of the group, and the demonstration that followed saw the police using heavy repression with pepper-spray and making18 arrests. A spontaneous demonstration against police repression was called for that evening, with 1000 people showing up to express their anger at the police for the violence committed toward them earlier that day. That Monday, the Senate released an ultimatum for those of the Lampedusa group who had previously been identity-checked: they were to go to the immigration department – in preparation for deportation – before Wednesday, or the police would start raiding residences. The Rote Flora (a squatted social space and organisational hub of much of Hamburg’s radical left) responded with their own ultimatum: Stop the racist controls against the Lampedusa group before Tuesday, or expect repercussions. The controls didn’t stop, and an illegal demonstration was called for by a number of different groups in the Sternschanze district of Hamburg. More than 2000 people turned out, and over 1,000 cops. Property destruction and injuries to cops occured, and a handful of people were arrested . Larger numbers had their ID’s checked and names and addresses taken. Tuesdays’ demo had wide media coverage, making front page news in the main local newspapers, and awareness of the Lampedusa in Hamburg group could be seen spreading across the city. Over the next couple of days, smaller groups attempted to interrupt and prevent controls that continued to happen near the migrants’ temporary residences, such as the church in St Pauli. On Thursday morning, a rush-hour traffic blockade took place in the city centre, in the evening a group of around 500 activists were immediately kettled before their demo was about to start . Meanwhile, around 300 others got away with smaller, spontaneous demonstrations in other parts of the city. On Friday another few actions and demos took place, including an attempted block of a central S-Bahn station and a smaller, more militant spontaneous demo through the Sternschanze district. 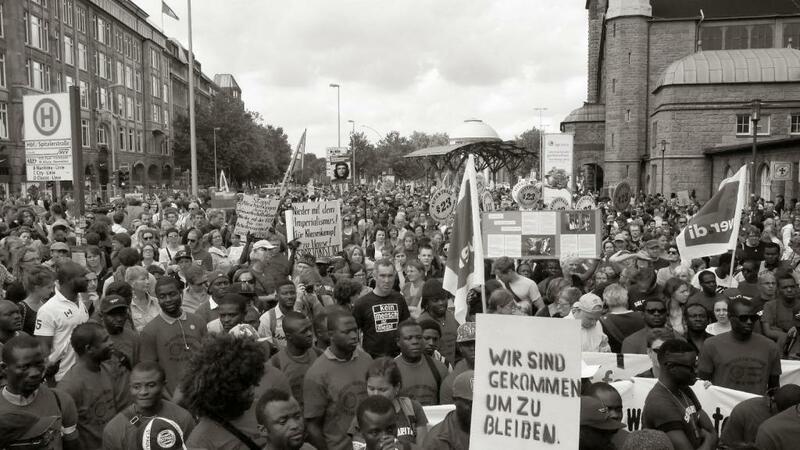 A similtaneous demonstration through the city, which combined the topics of the “Right to the City” movement and the Lampedusa in Hamburg struggle, brought together another 1,500 people and was able to march throughout much of the city. The Police Union released a statement on Friday declaring themselves “on the limit”, and suggesting that they would have to “adjust to more labour-intensive operations”. A demonstration of around 1,500 people declaring “Refugees Welcome!” in Rostock took place on Saturday, a city infamous in the North for its history of neo-nazi activity and the 1992 pogrom. Some of the Lampedusa in Hamburg group were in attendance and gave speeches about their struggle in Hamburg. On Sunday night, another spontaneous demonstration occured, which was stopped about 300 meters from where it began by a large group of cops, who kettled and ID-checked around 50 people. Olaf Schultz, the mayor of Hamburg offered an ‘open discussion’ on Tuesday night with the ‘people of Hamburg’. A critical mass group of 500-600 cyclists rode 5km and demonstrated outside the venue. The following weekly Wednesday demo attracted another 500 people, and their energy echoed through the city centre. During the speeches, the crowd heard that a demonstration in solidarity with the Lampedusa in Berlin group had been met with police brutality and many arrests, and that a member of the group had been hospitalised. The crowd in Hamburg responded with increased energy, chanting “Police! Assassins!” amongst other angry slogans. Tonight, a tower in the centre of St Pauli was squatted, and the cops continue to guard it. The demonstration that took place tonight has brought an increase in strength to the movement. We expect continuous demonstrations until the Lampedusa in Hamburg group are granted the right to stay from the city of Hamburg. Demonstrations in Germany must be declared and approved by the police before they begin, otherwise the protest is illegal. It is possible to ‘legalise’ a protest that has already begun, however in order to legalise a demonstration there must be at least one person whose data is recorded and is ‘responsible’ should illegal activity occur. I will use the word ‘spontaneous’ to refer to an illegal demo.